Two questions have been coming up lately in conversations with folks coming to the farm — What are the pieces of plastic for? & What does “Transitional” mean? You’ve all driven by the piece of plastic along the driveway near the sign, and some of you have seen the strips running through the field in various places. If you go pick BLUEBERRIES (opening this week!! see “Nuts and Bolts”) you’ll see a few much larger pieces on the NW corner of our farm. Longer answer: The plastic is mostly used greenhouse covers we got from friends, and is being used to “solarize” areas to prepare them for planting of native grasses and flowers. Solarizing has been used for gardens and other things for decades, and is being trialed as a way to limit weed competition in establishment of native plant communities. We’ve been working with the Xerces Society, with funding from NRCS (your tax dollars doing good), to plan and implement these plantings. Xerces Society is a leading nationwide group working to protect and proliferate native insects and their habitats. They understand that organic farms can be excellent insect habitat but often are not, and they have the expertise to help us make the best management decisions to maximize the benefits of diverse and bountiful insect and plant populations — pollination of crops and wild plants, pest management, and awesome beauty! Our main driving interest has been pest management though. We love bugs, watching bugs and the patterns and anomalies of their populations. Our understanding only scratches the surface of the insect world, but in growing plants the relations between soil, insects, water, and sky is right in our face all the time. We’ve never used an insecticide, out of concern for human health and beneficial insect health, and managing the farm for predatory insects has always been a priority for us. Fortunately it’s a very beautiful management decision, since a wide array and constant supply of flowers — in the u-pick section, throughout all the fields, in the woods and on the edges — brings in the widest array of predators. There’s still lots of planting to do in the next few years! The magic in this is that many predatory insects are pollinators at one stage or another of their lives — while a tiny wasp or bee adult may feed on nectar, the larva may be vicious predators. Lacewing larvae (while not bees or wasps) are like 1/4″ long dragons, cruising around devouring aphids and other pests. So each year we’re planting prairie strips and blocks in various places around the farm, and the plastic is helping knock back the weeds before we plant. We plan to plant a lot of the areas this fall, and next year there may be a small area covered in plastic, but hopefully we’ll have lots more areas covered in a wild mess of flowers and grasses. What does “Transitional” produce mean? Short answer: A transitional crop is one that was grown with all the same organic practices we always use, but in a field that had a non-Organic-approved pesticide or fertilizer applied to it less than 3 years ago. This year we have a wider variety of crops growing in a couple new fields east of the older strawberries up by the oak tree, so you will be seeing more transitional signs than in previous years. It was two years ago that field was last sprayed, which makes crops grown in it eligible for organic certification in July 2017. Of course we wish we could offer you produce only from fields never sprayed with pesticides. But the reality of farming and farmland today is that in order to have more organic farmland and food we are transitioning land from the chemical era into an organic future, for the health and benefit of all beings, large and small. More carrots, cucumbers, broccoli, summer squash and zucchini, plus cabbage and hopefully beets. What a joy to be eating these crisp and complex flavors again! Baby leeks, which are very mild and can be used much like scallions. We’ll have all the same greens and leaf lettuce. Head lettuce should last 1-2 more weeks, it’s loving this cool weather, which lets it grow slowly and not rush to make seed — which is when it gets more bitter. The hot we have had has given the leaves a bit of bitterness, but it seems to us it’s still within the range of yummy. Sorry about the bitter kale a couple weeks ago! We should have had a sign on that week’s harvest to dress or sauce it thoroughly, or just given it to the chickens. The plants had been stressed out by flea beetles and looked hungry to boot. They pulled out of it though and while it’s not as good as fall kale, it is better now and worth frying up and adding soy sauce, peanut sauce, sesame oil or the like. We’ll probably harvest garlic this week, and we’ll add it to the share after it dries a bit, in a couple weeks. This may be our earliest garlic harvest ever — it got off to a very early start after the early snow melt, and like many perennials and overwintered crops, it’s a couple weeks ahead of ……”normal.” The heads we’ve pulled to examine have been very large, apparently due to the early start. Our beets….just aren’t ready this week. They’re in a gravelly, low nutrition spot and just aren’t sizing up yet. Like the kohlrabi — though the kohlrabi also had the uphill battles of bug damage and a cover that surprised us an wasn’t letting water through. In 2-3 weeks — sweet onions, and we’ll probably see a few eggplants, peppers and tomatoes in July. Peas and Flowers, and Green Beans! By now you’ve probably found our hiding spot for the peas, north and east of the barn. 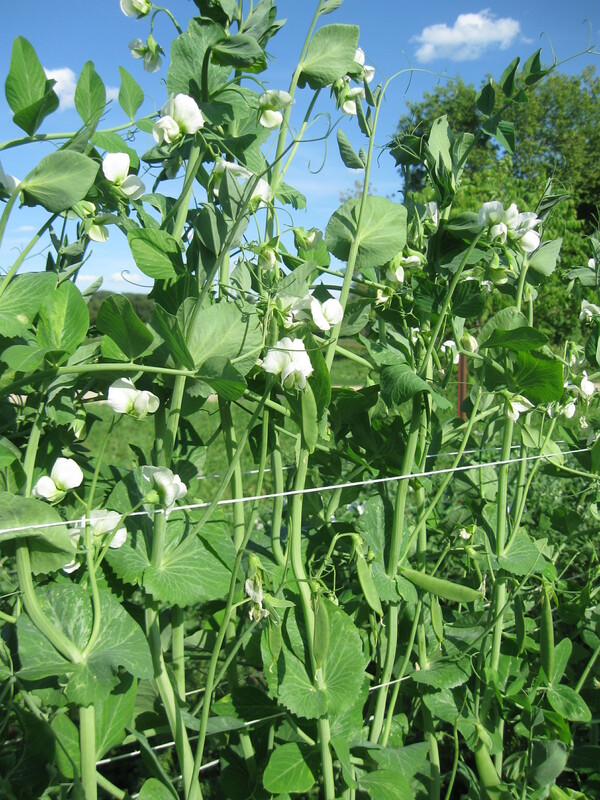 The peas have gotten some blemishes on the pods — it appears to be bacterial blight, but whatever it is will shorten the picking season. There are some without the spots that have been able to size up, but it looks like we might not even have much left by the end of this week. The green beans are easy to find, just east of the driveway. Beans should be open for limited picking by next week, and then more soon after that, to pick the rest of the summer. The rest of the plantings look super, ready to crank out some piles of green, yellow, purple and purple-spotted beans. There will be the white wooden signs in the field marking where each color / type is. The purple color “vanishes” when cooked but is stunning raw. Plus cilantro, dill, lemon balm, mint. We hope you got plenty of good strawberries. We’ll do our best to have a similar or better harvest for next year! And as we trial new varieties and hear back from you, we’re adjusting each year’s planting to bring the best balance we can of excellent flavor, big berries, and a slightly extended picking season. We also try hard to manage the picking limits so everyone gets a fair share and as much as we can provide. BLUEBERRIES! Certified Organic! Next Door! Holy Smokes! Little Hill Berry Farm, Molly McGovern and Aaron Wills, old friends and OH farm members. U-pick is open this week, next door on 320th Street — sign up here to see the days and hours, and to sign up for their picking updates email list. NEW — Pre-picked blueberries available at your share pickup here, starting next week, the week of July 11th. Place orders to Aaron and Molly at info@littlehillberryfarm.com, and they’ll have pricing and instructions for payment. Thank you to all the folks who came over for the potluck! It was good fun, we and the mosquitoes ate well and the kids ruled the place. About 40 people came — it was great to have folks together. We apologize we didn’t make a tour happen — if you’d like one please let us know and we’ll look into scheduling one later this summer. Next potluck we do we’re thinking maybe we’ll try our luck at lunch, for fewer mosquitoes. Sesame: Whisk together 2 Tbsp soy sauce, 2 Tbsp rice wine vinegar, 2 Tbsp Asian sesame oil, and 2 Tbsp honey in a large bowl. Toast ½ cup sesame seeds in a heavy skillet; let cool. Mix the broccoli and half of the sesame seeds into the dressing. Marinate at room temperature for 30 minutes to 2 hours, tossing occasionally. Transfer the broccoli to aplatter, pour the dressing over, and sprinkle with the remaining sesame seeds. Chicken-Herb: Mix the broccoli with 3 cups chopped cooked chicken, ¼ cup chopped fresh parsley or dill, and ¼ cup sour cream. Add salt to taste.